BRISBANE Catholic priest Fr Andrzej Kolaczkowski likes nothing more than spending time in fellowship with outlaw bikie club members, sharing the Gospel. “There’s something really refreshing when you sit down and do Bible study … with a bunch of hairy bikers full of tattoos. There’s nothing more refreshing to the faith,” he said. 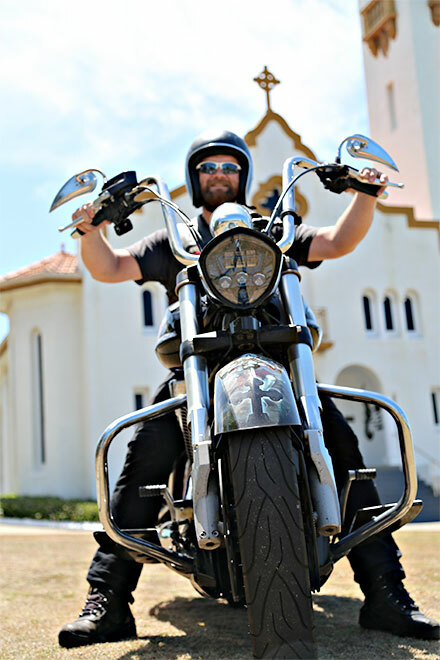 Dressed in bikie leathers and straddling a classic Victory Crossroads motorcycle it is hard at first to recognise Fr Kolaczkowski as the parish priest at Bowen Hills’ Our Lady of Victories Church and chaplain to the Polish community in Brisbane archdiocese. However, Fr Kolaczkowski is following a lifelong passion for motorbikes and using his hobby to serve the Lord. His pride and joy is his Victory Crossroad motorcycle, with petrol tank and panels spray-painted with Gothic-style artwork and with words from Ephesians 6:10-11, “Strong in the Lord and in the strength of his might put on the whole armour of God”. “I love them, bikes,” Fr Kolaczkowski, who spent his high school and university years in Australia, and was ordained in his native Poland in 2003, said. “One thing about any hobby is you can use it as part of evangelisation or you can use it purely for yourself as a source of happiness and joy. For the past three years, Fr Kolaczkowski has ridden with the God’s Squad Christian motorcycle club, and recently he earned his “colours”, which means he was now a full club member, after joining as an associate and then serving a period of prospecting. He is the first Catholic priest to become a God’s Squad member, and he sees the club as an important ministry – a way to bear witness and to support those on the margins of our society. “God’s Squad was one of the things that came as part of discernment of where God wanted me to be,” Fr Kolaczkowski said. God’s Squad was formed in the late 1960s in Sydney. It grew out of the counter-culture Jesus movement days, under the leadership of John Smith, ministering among the “outlaw biker fraternity” and associated groups, where it is an accepted and relevant expression of Christian churches. 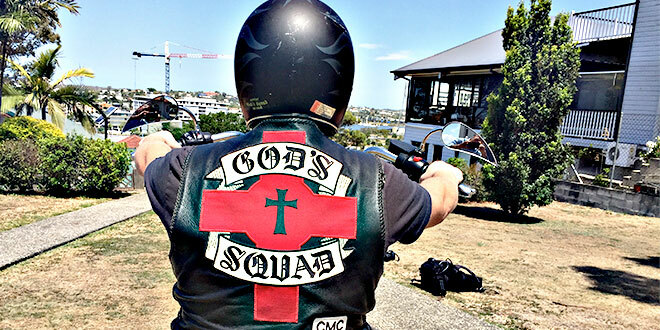 Holy road: Fr Andrzej Kolaczkowski shows his colours as a member of the God’s Squad Christian motorcycle club. In Brisbane, God’s Squad holds fortnightly prayer meetings and weekly social meetings in a clubhouse in Park Ridge, and its eight members, as well as nominees and associates, which include a pastor from the Church of Christ, take part in organised rides with bikers as well as going out amongst the outlaws, or “one-per-centers”, to bear witness. Fr Kolaczkowski believes the need is great, but it takes a long time to gain the trust and acceptance of the outlaws. “Let’s be honest, out there, there are a lot of lost souls. People who have lost their ways or have been hurt and who else can heal them if not Jesus?” he said. “Unless we go out there and reach out to them they won’t come to us. It’s all about mutual respect and first of all respecting the person. Queensland Parliament recently passed a suite of proposed laws to replace the state’s controversial anti-bikie legislation. The new laws will largely replace the Liberal National Party’s anti-bikie measures that were introduced after the now-infamous Broadbeach gang brawl in late 2013. Premier Annastacia Palaszczuk said Labor’s plan was to focus on the criminality of individuals rather than the name of their gang. 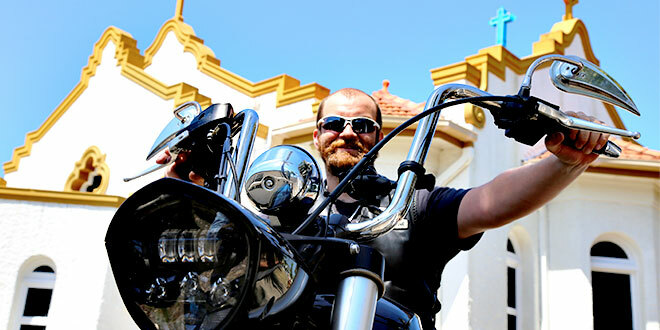 God’s biker: Polish priest Fr Andrzej Kolaczkowski is the first Catholic priest in the God’s Squad motorcycle club. Fr Kolaczkowski said it was a big misconception that all bikies were criminals. “That’s not true. You will have criminals like you do in any group but a lot of people don’t join the motorcycle clubs because they are looking for a life of crime,” he said. “Very often it is the brotherhood or feeling that’s where they find support and understanding. That’s where they can be themselves. “When they come to us, Bible studies for example, they come because they are interested, they want to hear something. “They might still not believe themselves, but what they want is to learn something more about it – more about the faith, more about Jesus. “And let’s be honest, before they come and talk, they’ll be observing to see first of all how authentic you are – do you live by what you preach? “And I think that’s the biggest challenge that we have to remind ourselves that wherever you are, whomever you are with, you’ve got to be a witness.